Well, hard to believe that I wanted to do this again…after the rain and the cold of 2018 but I couldn’t wait to sign back up to be a member of this incredibly inspiring team! So…without further ado here it is… that time of year again and I am so excited to announce that I will be running the Boston Marathon for the Credit Unions Kids @ Heart Team to support Boston Children’s Hospital! Being a member of the Credit Unions Kids @ Heart for the last 4 years has been an amazing experience. This group of extraordinary people and the work they do have become like a family to me, and it is a privilege to call myself a member of this team! Because of Credit Unions Kids @ Heart I have been given the incredible opportunity to run for an amazing young man my patient partner Sammy! Sammy will be a teenager next month…13! He is the sweetest boy I have ever met. His parents April and Alain and his lovely grandparents are such wonderful people and I’m so happy they have come into my life. Sammy has Cornelia de Lange Syndrome. Cornelia de Lange Syndrome is a genetic birth defect that affects roughly 1 in 10,000 kids. Sammy has many of the same issues as other kids with this syndrome. He is small for his age; he has limb deficiency in his arms, moderate hearing loss, some developmental delays, and is unable to walk, or talk. In addition, he is more susceptible to seizures. Sammy sees many specialists at Boston Children’s Hospital, and has spent weeks at a time there, on occasion. So the hospital is so important to he and his family. With the generous support of Credit Unions Kids @ Heart I have committed to raising $12,500 for Boston Children’s Hospital. It is important to note that every year the Credit Unions Kids @ Heart team donates 100% of the money raised to doctors doing specific research at the hospital. This team has been working hard to support the hospital for many years. In the last 3 years alone our small but mighty Credit Unions Kids @ Heart team has raised over $1 million dollars and every single cent went to research at Boston Children’s Hospital…but we can’t stop now, so we need your help! 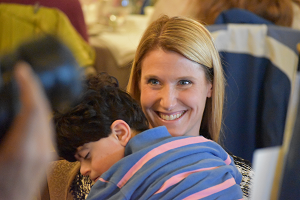 This year’s money will go to doctors at Boston Children’s who are researching Pediatric Epilepsy, Cerebral Palsy, Moyamoya Disease, Sturge-Weber Syndrome, and Pediatric Brain Cancer. Many of the kids on our team are coping with these very ailments so the work these doctors do is helping them right away. Their research is offering cutting edge discoveries and most importantly that needed hope and support to families. Sammy is my inspiration and I can’t wait to run to help make a difference for him. Please consider making a tax-deductible donation to Boston Children’s Hospital, to help me reach my goal. I thank you in advance from the Credit Unions Kids @ Heart family, the patient partners, and all families that receive care from this outstanding facility.